Freight yards are used for breaking up trains, sorting the cars, and making up new trains. There are also yard tracks for storing cars that are not immediately needed. Railroads try to avoid storing cars, though, because a freight car that is not moving is not earning any money for the railroad company. Large yards have separate sections where trains are broken up, sorted, and made into new trains, while smaller yards make do with more limited numbers of tracks. 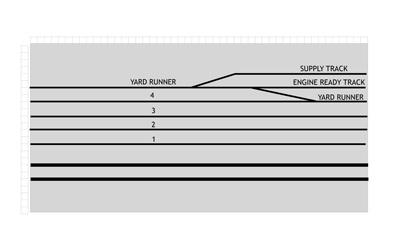 Most yards are flat (or nearly flat) which requires switch engines to push and pull cars back and forth, to sort each car into the correct position in the yard. 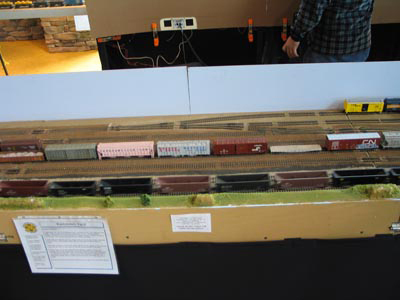 Another type of yard (not modeled on this layout) is called a "hump yard" because the cars are pushed over a small hill, called the hump, and allowed to roll downhill into the yard. They are directed to the correct track by remote-controlled track switches. Hump yards are more efficient to operate, but also more expensive to build, and are usually used at key points with large amounts of traffic. Some yards also have associated facilities for car repairs and locomotive repairs. The western portion of the classification yard, where trains are made up.